You will have heard in the news about the recent Facebook scandal, involving the analytics company, Cambridge Analytica, who collected the personal data of about 50 million Facebook users and who then used this data to show more targeted political advertisements to those users at the time of Trump’s 2016 election and during the Brexit referendum, with the intention of swaying votes. If you haven’t heard about this then you are almost certainly living under a rock, or maybe even under a rock on a different planet. Since the news broke there’s been a tidal wave of users throwing in the towel on their Facebook in favour of keeping their data theirs and standing on their own moral ground far away from the social media giant. The #DeleteFacebook campaign has been trending on a mass of other platforms like Twitter and Linkedin, encouraging others to do the same. Naturally, this will get brands thinking. 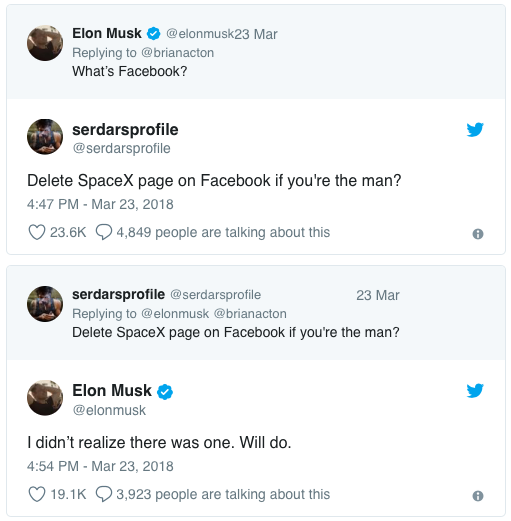 Elon Musk has pulled SpaceX’s and Tesla’s Facebook presence, Mozilla also got onto the bandwagon and pulled their Facebook activity and even have added a new extension to Firefox to separate Facebook from other internet activity, whilst Whatsapp Co-Founder Brian Acton urged people to #DeleteFacebook. Elsewhere, Commerzbank have gone dark whilst they investigate data security on the platform and music tech giant Sonos have gone dark for a week stating in a blog post: “We are concerned by the recent revelations about Facebook and the exploitation of its platform. The Cambridge Analytica scandal, like many recent headlines coming out of Silicon Valley, raises questions about whether Big Tech is doing enough to balance its own interests with one of its biggest responsibilities: Safeguarding your privacy.” But, they haven’t gone for good, also noting that they are firm believers in using tech to bring people together, meaning that this move is merely a statement to get people talking about the movement. And so now, if you are a marketer, you may be wondering about the impact this could have on your Facebook marketing going forwards? Right? Well, maybe not, but perhaps you should be thinking about it. Facebook’s shares have plummeted in recent days and online there has been more and more questioning around the morality of the platform, which seems to be losing them users. The violation of consumer trust has particularly angered parents across the globe who are questioning the amount of data potentially being bought and sold about their children. Could this have an impact on marketing within these industries? Only time will tell. But, Facebook has now started putting in measures and new features to ensure more transparency with data privacy settings, since adding tools that will allow users to see these settings in one place as opposed to across the previous 20 or so pages. They claim that this has been in the works for some time now in preparation for the new EU General Data Protection Act that will be coming into place in May. In a similar way, we are likely to find that, for brands, acquiring data is going to become far more difficult than ever before. They will have to start really proving their worth to consumers and will have to start being more explicit and responsible. We are already now starting to question who else has been working in the same way as Facebook, if the biggest fish in the pond can do it, then it has the potential to be a fairly common secret phenomenon. Others with access to personal data which would be worrying for consumers could include the likes of Uber or Tinder, with Tinder having been shown back in September to sometimes have hundreds of pages of personal data on their users, including where they’ve lived, their gender, their interests, who they've dated etc. The Tinder report on personal data also tells you whether or not your data has been sold on or used by third-parties, but the waiting time for their report can be up to a month. So here’s to hoping that they haven’t been involved in any dodgy dealings as we’ve seen with Facebook. Facebook itself may be forced to increase their Cost Per Click on Facebook Ads to be able to keep up with the decline in users, making the Facebook Ad marketplace more of a premium one. Because of this, we could see a strong move towards other platforms and even more emphasis on Google Ads as ad-spend shifts to other options. But, don’t give up on our one of oldest ‘friends’ just yet as any significant change will take its time and the recent anti-Facebook vibe from brands could just signify an immediate reaction to the scandal as opposed to a lasting one. If this is a short-lived media story then we should at least come out of this more knowledgeable about data than ever before. As a marketer, it would be a good move to take the recent events as a reminder that the average person is becoming more and more savvy to their own data, who has it, what they could do with it and how to protect it. So, this should be a wakeup call for you and your business to get cracking with being ready for GDPR. The new General Data Protection Act comes into force in May and will mean big changes and tighter regulations on how we acquire data and then how we use it too. You’ll need to have a long hard think about your own data acquisition and practices and use the Facebook drama as a stark warning of the possible fallout from not adhering to an unspoken, soon to be spoken, moral code of data. Need some help with GDPR? We organise monthly roundtable events where we discuss GDPR best practice and work out what the next steps should be for you to be compliant by the 25th May. There’s a complimentary breakfast and it’s a great opportunity to share your concerns with other professionals. Please contact us if you would be interested in attending the next event and in the meantime please check out our vlog on GDPR.